We’d love your help. 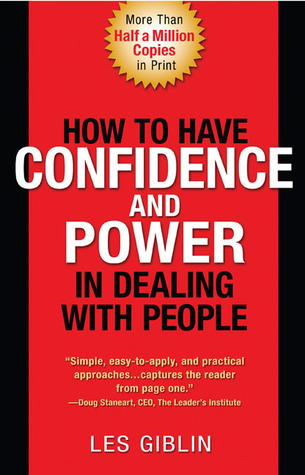 Let us know what’s wrong with this preview of How to Have Confidence and Power in Dealing with People by Les Giblin. Taking a brass tacks approach to communication, How to Have Confidence and Power in Dealing With People explains how to interact with others as they really are, not as you would like them to be. The goal is to get what you want from them successfully – be it cooperation, goodwill, love or security. Les Giblin, a recognized expert in the field of human relations, has devi Taking a brass tacks approach to communication, How to Have Confidence and Power in Dealing With People explains how to interact with others as they really are, not as you would like them to be. The goal is to get what you want from them successfully – be it cooperation, goodwill, love or security. Les Giblin, a recognized expert in the field of human relations, has devised a method for dealing with people that can be used when relating with anyone – parents, teachers, bosses, employees, friends, acquaintances, even strangers. Giblin shows step by step how to get what you want at any time and in ways that leave you feeling good about yourself. Moreover, the people who have given you want you want wind up feeling good about themselves, too. The result? Nobody gets shortchanged. It’s a win-win situation. To ask other readers questions about How to Have Confidence and Power in Dealing with People, please sign up. "The man or woman who realizes that he is "something" not because of what he has done or how good he has been, but by the grace of God in endowing him with a certain innate worth, develops a healthy self-esteem." -Les Giblin, p. 13. I stopped reading there. I've read this book several times over the years. Along with Dale Carnegie's "How to Win Friends and Influence People" this book is a must-read for anyone that wants to be able to communicate with other people in any meaningful way. I would especially recommend for those of you who tend to be introverted (like myself). هي اقرأ الكتاب بتركيز واهتمام..
مع أنه أصلاً يجبرك رغماً عنك على القراءة بتريث ..
قوة التحكم في الذات،تشابه المحتوى بشكل واضح. I listened to this on audiobook and it is only about three hours, but the program is packed with useful and applicable information. You can start using what it talks about from only listening to the first few minutes. This book is about human relations and every suggestion, technique, and principle discussed was right on. Admittedly, much of it seems like common sense after hearing it or I have read it before (How to Win Friends and Influence People), but most of us need to hear or read somethin I listened to this on audiobook and it is only about three hours, but the program is packed with useful and applicable information. You can start using what it talks about from only listening to the first few minutes. This book is about human relations and every suggestion, technique, and principle discussed was right on. Admittedly, much of it seems like common sense after hearing it or I have read it before (How to Win Friends and Influence People), but most of us need to hear or read something a minimum of 6 times before it starts to become a daily practice, so I enjoyed the unique spin the book had. How to Have Confidence and Power in Dealing with People Review by Vanga Srikanth..
One of the pioneers of the personal development industry, Les Giblin was born in 1912 in Cedar Rapids, Iowa. After serving in the military, Giblin began a sales job with the Sheaffer Pen Company in 1946. His successful career in door-to-door sales allowed him to become an ardent observer of human nature and eventually earned him two titles as national Salesman of the Year. Talking lessons from his s How to Have Confidence and Power in Dealing with People Review by Vanga Srikanth..
Make the most of your personal connections as taught by the master of people and sales skills. I am a shy person naturally, so this book really helped me. It is a timeless classic that helps you relate to other people in a variety of settings and cultivate friendships. It also talks about how to influence people, which is good if you are in sales or simply trying to get your way with something important to you. If you have trouble handling people, this is the book for you. Sure, it was written in the 1950s, but it does NOT need to be updated. Everything the author says is true; and he explains it all in an easy, understandable, and thoughtful way. One of my favorite parts is when Les Giblin tells a story about one of his friends who walked up to total strangers and chatted with them as if they were old friends. ("No one ever called him fresh or rude.") Giblin asked his friend what his secret was. His friend's secret is revealed; Buy this book, b/c it's worth it! Ch9. How to use the technique that a supreme court justice called "White Magic"
Certainly the chapters above seem common in many interpersonal relationship books. However, I am obliged to praise the author for his outstanding writing skill, clever use of short stories to elaborate the rationale behind his many useful tactics, and those helpful summaries in the end of each chapter. Even if you are a frequent self help book reader, it will still satisfy you well with the no nonsense points. In short, highly recommended! p.s. Below please some of my favorite passages for your reference. I talked myself out of a speeding ticket after reading this book. 5 stars in my opinion. I read the book “ How to have confidence and Power when dealing with people”. Les Giblin wrote the book, the genre of the book would be an informational type of book. Its a non fiction leadership book so what the book talks about you can apply it to everyday situations. More than five years ago,Les Giblin first described how mastering the basic principles of human behavior could ensure success for business people, and just about anyone else. Today hundreds of thousands of readers can attest, his I read the book “ How to have confidence and Power when dealing with people”. Les Giblin wrote the book, the genre of the book would be an informational type of book. Its a non fiction leadership book so what the book talks about you can apply it to everyday situations. More than five years ago,Les Giblin first described how mastering the basic principles of human behavior could ensure success for business people, and just about anyone else. Today hundreds of thousands of readers can attest, his advice as relevant as ever. “How to have confidence and power in dealing with people” is a truly practical way to gain self confidence power in your personal, business, and social relationships from little tricks of body language that we rarely notice in ourselves but yet notice almost always in others, but its to develop self belief. How to have confidence and power in dealing with people helps you get what you really, with integrity and ease. Lers Giblins tested techniques and common sense pointers will teach you how to: use basic secret of human nature to influence people, Control others” attitudes and expectation through your own behavior, Discover the three big secrets for attracting people, Get people to see things your way quickly, and ensure 100 percent cooperation when managing others. Make the most of your personal, social, business potential with the nature power you already possess. When I saw the book was first written in 1956, I wasn't sure if it would be relevant in today's society. I was pleasantly surprised, the format of the book was easy to understand and follow. "A starved ego is a mean ego"
This book had been sitting on my bookshelf for years and I was expecting it to be an over the top sales book so had put off reading it, but I was so wrong and now wish I had read it years ago. This is a superb book that has lots of great advice, good examples and is well written. I also really appreciate the short recap that each section has at the end summarising the key points. No matter how great or horrible you are in dealing with people, this book has great insight into how the other person is wired and how you can help in growing teams of people, resolving conflict and become an expert in working with people! This book helped me tremendously at a point in my life when I lacked confidence in social/work situations. It's an oldie but a goodie. One of the best books on people skills out there. Definitely one to read more than once. Recommended for any manager, business owner or anyone just looking to grow more confident in dealing with people. i want to read it but how ? im really want it ? Interesting concepts. I will have to see if I can put them to work at work. Excelente lectura .. ahora a implementar los conocimientos y realizar nuestro autoanálisis .. This is a wonderful book on human psychology and human relations. It contains so many little nuggets of "common sense wisdom" and guidelines for how to deal with people. Most of it can be summed up with the Golden Rule - treat others as you yourself want to be treated. I really liked the summary sections at the end of each chapter, which can serve as a great list of guidelines for dealing with people. I thought the title sounded hokey and contrived, but I sure was wrong! This is a must read for everyone who deals with people and unless you're a hermit, that means you. The relationship principles are very easy to apply and the fun thing is you can start using them right away. It's a lot of fun to see an immediate difference when you're out and about interacting with co-workers, your server at a restaurant, your parole officer, your mom, even your wife! Knowledge is power. I'm glad that Giblin kept this short, concise and most importantly, relevant - these "how to deal with people" books can get tedious and repetitive. This was more like an extended version of the classic "How To Win Friends and Influence People". There's a lot of practical and up-to-date examples of how to use the techniques suggested. This book was great. It was written a while ago but the principles still apply. Human relations haven't changed as much as we think. People still love to talk and hear about themselves. I have a lot of work to do to have a bit more confidence when talking to people. But, the number one lesson I learned was to let others talk. I need to learn to LISTEN better and more often than I speak. 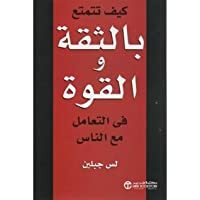 كتاب يستحق القراءة اكثر من مرة مع تركيز ,اسلوب الكاتب ممتع ورائع وغني بالنصائح في التعامل مع الناس . One of the pioneers of the personal development industry, Les Giblin was born in 1912 in Cedar Rapids, Iowa. After serving in the military, Giblin began a sales job with the Sheaffer Pen Company in 1946. His successful career in door-to-door sales allowed him to become an ardent observer of human nature and eventually earned him two titles as national Salesman of the Year. Talking lessons from his One of the pioneers of the personal development industry, Les Giblin was born in 1912 in Cedar Rapids, Iowa. After serving in the military, Giblin began a sales job with the Sheaffer Pen Company in 1946. His successful career in door-to-door sales allowed him to become an ardent observer of human nature and eventually earned him two titles as national Salesman of the Year. Talking lessons from his sales career, Giblin penned his classic Skill With People in 1968 and began conducting thousands of seminars for companies and associations including Mobil, General Electric, Johnson & Johnson, Caterpillar, etc.